Rajshri Kamble of Gevarai village in Beed district of Marathwada wanted to help her mother fetch a bucket of water but she lost her life after falling into a well. Kamble was all of 10 years old. Komal Hande, 16, from Ghatsavali village in Beed, died at a local well while washing clothes. Manohar Harale and Rohit Bhagat (both 14 years old) died after getting stuck in the mud of a pond while fetching water. Natabai Tekale, 55, was waiting in a queue in Latur for water since dawn. She did manage to get a bucket of water but died of a heart attack before she could carry it home. Such horrific instances of avoidable deaths have become all too common in this area of severe water stress. The situation in this drought-prone region in the western Indian state of Maharashtra is so desperate that there have been 29 deaths related to water scarcity in February and March 2016 alone, according to official estimates. India suffered its worst monsoon in six years in 2015, with a 14% rain deficit. More than 300 districts across the country, which is nearly half the total number, received at least 20% less rainfall than normal, according to the India Meteorological Department. At the end of the June-September southwest monsoon season, almost 40% of India received deficient rainfall. Coming right after the 2014 drought, the poor monsoon led to total distress in the farm sector, which provides livelihoods to some 70% of India’s 1.25 billion people. With the 2016 monsoon over two months away, most reservoirs in the country are running on empty. The situation is particularly bad in Marathwada, where water scarcity forced authorities in Latur to impose prohibitory orders around the local reservoir to avoid fights breaking out among desperate residents. Under the orders, not more than three persons can gather around the reservoir at a time. The Intergovernmental Panel on Climate Change has said in its latest assessment report that one major impact of climate change is erratic rainfall. Proving this point, Marathwada has had a history of chronic droughts in the past two decades due to erratic rainfall. There have been numerous incidence of negligible or no rains in June and nominal rainfall towards the end of July that seriously hampers crop growth. Many times heavy showers on the eve of a harvest have ruined standing crops. In the past 7- 8 years, untimely rain and hail storms in February or March has become a regular phenomenon, affecting the spring harvest. Even when the total rainfall remains within the average, the number of rainy days has typically decreased from 75 days to about 55. Untimely showers for as much as 48 hours have also taken a toll. This change has been disastrous for the agriculture sector in Marathwada, leaving the 10 million people who live in this region perpetually in want of water. The region’s outcry for a bucket of water has perhaps reached a tipping point. The struggle to obtain water is testing the patience of people who have to walk miles for it. Women have to stand in queues for hours for a precious pot of water from public water taps. Transportation of water has become an onerous task for the district authorities in Latur, one of the worst affected areas in Marathwada, who now have to provide police protection to water tankers. This appalling scenario is similar in all eight districts of Marathwada. There are some 46,000 homes in Latur, with a population of more than half a million. Half of the 25,000 bore wells in the area went completely dry in February. 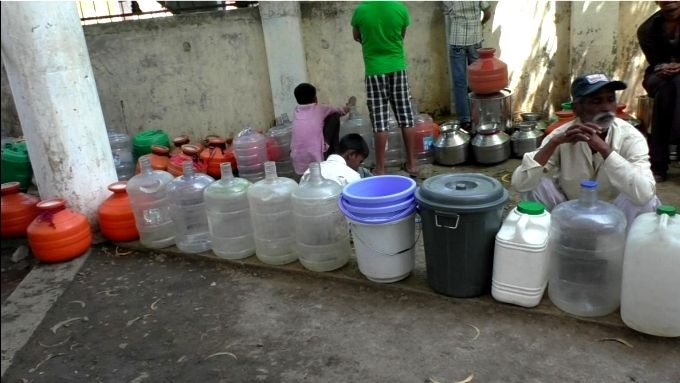 Before February, 6,000 litres of water used to cost INR 500 (about USD 7.5) in Latur. The price doubled by the end of March. Water tankers now dominate the city. As many as 1,400 tankers are now supplying water to Latur; they have an estimated daily turnover of INR 5 million. Since the rains have become unpredictable, the dependence on bore wells in the region has increased exponentially, resulting in a precipitous declined in the groundwater level. Official records show that till 1980, bore wells were hardly 50 metres deep. Now no water is available without digging 100 metres. Digging till 150-200 metres has become common. The scarcity is not limited to farms and drinking water. The acute shortage, particularly in Latur, has practically stopped economic activities. As many as 500 small industrial units have downed shutters, construction projects have ground to a halt, hotels are deserted and hospitals are isolated. The vineyards and pomegranate gardens in the region are now practically worthless. Sugar factories are idle as the sugarcane harvest was meagre. Those who depend on daily wages for a living are being forced to migrate in large numbers in search of work. More than 100,000 workers have moved from Latur, according to local experts. This number is likely to be around 300,000 when the entire Marathwada region is considered. The water crisis in Marathwada is likely to worsen in the next few months. Good times will have to await the monsoon, with all residents hoping it will not be deficient or erratic again. water crisis in Marathwada is completely out of sync with the public policy of the rulers irrespective of party in power with different set of ideologies. Atul deulgaonkar has been pointing this out for many years.It’s high time to get the understanding and action together to stop the worsening of the crisis. Shocking. The narrative puts a much needed emphasis on the human face of this tragic situation. Need urgent solutions and planning for the days ahead. Too much loss has been suffered already and more should not be endured. sir i think we are missing the political angle about this situation. 1) to hide the intense drought situation in marathawada and issues of farmer suicide and its discussion govt is surfacing issues like bharat mata ki jai, vande mataram & sedition issues……2) sir you should expose financial calculations of tanker mafia, which force politicians to resort to temporary measures.